Weaning can be a time of significant change for calves, potentially causing rumen and intestinal upset, resulting in weight loss and scouring. To help avoid this implementing a progressive weaning process is important as to digest grass the rumen needs to develop. This is initially the role of the calf meal or pellets, then allowing young calves access to high quality grass. Calves do not like a sudden change of diet so do so slowly. 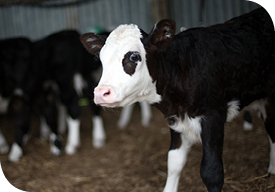 Calves with a rough looking coat and scouring are more likely to be suffering from infectious scours like coccidiosis or nutritional upset, as opposed to worms. Calf meals contain coccidiostats and once these decline below 1 kg per calf per day, they are not effective at managing the protozoan parasite. When calves are affected you will see a distinctive circular pattern of faeces around the tail with the faeces being blood stained and containing mucous. Coccidiosis can be diagnosed by taking a dessert spoon sized sample of fresh scours to your vet in a clean container. Many of the organisms that cause calf scours also infect humans so use good hygiene. In most cases it is not until a calf’s main source of feed is grass that internal parasites, or worms, become an issue. Worms will gradually reduce a calf’s appetite, resulting in weight loss. To control parasites use an effective oral drench. Note the first drench is not required until a month or so after grass is the main source of feed for calves. Before starting calf drenching, have your guns serviced. You can do this yourself by cleaning the gun in warm water and ensuring there are no leaks. Next, check that the gun is delivering the dose accurately using a measuring cylinder. A video on how to set up a drench gun can be found on the PGG Wrightson YouTube channel. For calves less than 100 kg Abamectin can be toxic so it is not recommended as the first drench. Instead a BZ-Lev combination like Combomax is often used. Faecal samples can be taken to your vet one to two weeks after the first drench to ensure it was effective. Calves are then drenched at a minimum of every four weeks using a triple combination product, like Triplemax, until the late autumn where the drench interval is extended. For more information around calf care contact your local PGG Wrightson Technical Field Representative, or visit the PGG Wrightson YouTube channel.